Welcome to the historic Hotel Bethlehem in downtown Bethlehem PA in the heart of the Lehigh Valley just minutes from Allentown and Easton Pennsylvania Lehigh University Moravian College and 10 minutes drive from the Lehigh Valley International Airport -ABE-. We are conveniently located in the heart of the historic district that surrounds our hotel in Bethlehem. Embrace our beautifully decorated and newly renovated historic Bethlehem hotel. Come experience world-class service charming guest accommodations elegantly appointed lobby and common areas beautiful yet efficient banquet and meeting facilities and award winning cuisine. We proudly continue the tradition of Bethlehem hospitality that began by the Moravians who first settled here in 1741. Come experience this hospitality at our historic Bethlehem hotel. Restored to its original 1922 grandeur Hotel Bethlehems floor-to-ceiling palladium windows provide dramatic views of the historic shopping district just outside our front doors. Seven large murals painted by George Gray and hung in the Mural Ballroom since 1937 retell the history of Bethlehem. In particular the story of how Count Zinzendorf and other early settlers met on Christmas Eve in 1741 in a crude cabin on the site now occupied by the hotel and named the city of Bethlehem emblazons an entire wall. 1741 on the Terrace: Try something new or revisit something familiar but above all -- enjoy. Relax in the ambiance of the room - the beautiful Moravian tile floor and soaring Palladian windows. The Tap Room: Lounge by the vintage mahogany bar- in an atmosphere evoking the Jazz Age- while sipping one of our Signature Martinis. 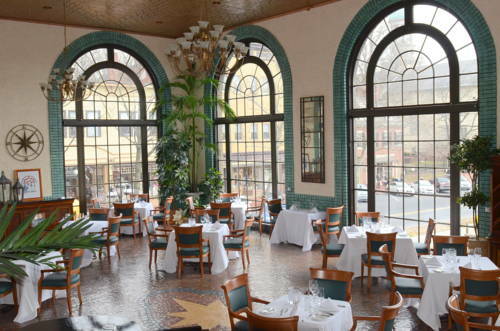 Enjoy all day dining overlooking the heart of Bethlehem*s historic district. -Located in the heart of Historic downtown Bethlehem -steps from quaint shops/charming boutiques/museums and great dining. 7 Miles from ABE Lehigh Valley International Airport.